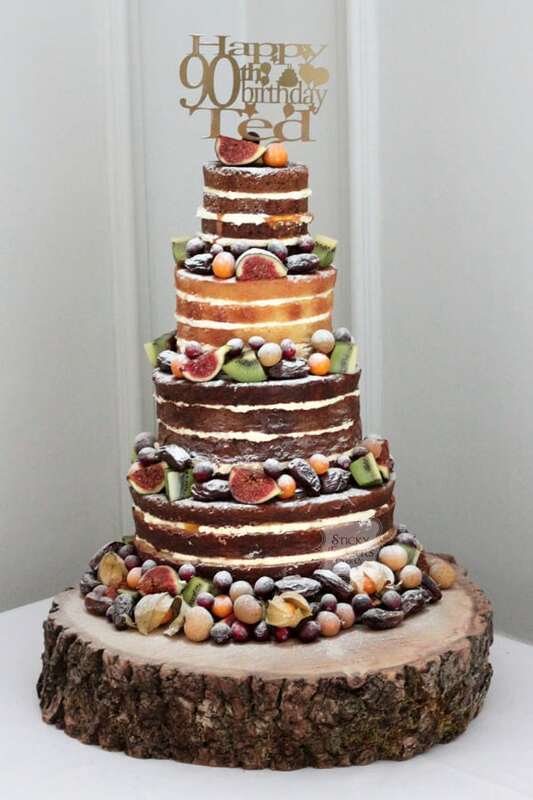 4 Tier Naked Cake with Autumn Fruits for the Lovely Ted! I don’t often bake birthday cakes but couldn’t say no to Lorraine when she asked me to make one of our delicious naked cakes for her Father-in Law’s 90th birthday celebration at the gorgeous Greenwoods Hotel and Spa in Stock, Essex. It was the first time we had been to deliver to this fabulous Essex venue and they really did pull out the stops for dear Ted’s birthday, there was obviously a lot of love for him. Flowers, balloons, the cake (obviously!) it was going to be a spectacular party that’s for sure. The flavours they chose were White Chocolate & Passion Fruit (Ted’s favourite), Salted Caramel and Lemon Limoncello and I decorated the cake with an abundance of Autumnal fruit and a dusting of icing sugar. Wishing Ted the happiest of birthdays!